Ubuntu 12.04 has been released a few weeks ago. The nice thing about a fresh new operating system is that it contains a new kernel with new drivers. That’s one of the good things, the bad thing is that some hardware need additional configuration to get it to work. This is about the SpeedTouch 120g, which is not a very new wifi adapter. In the Netherlands some providers delivered it with a new Internet connection. See the pictures of the card below. 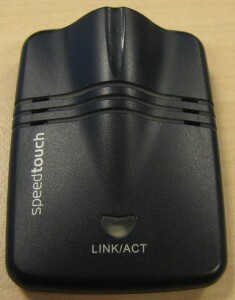 The device is a 802.11b/g adapter with a prism54 chipset. 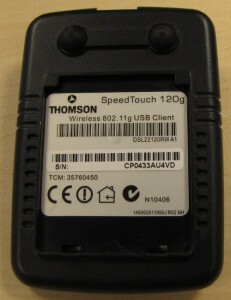 It is provided with usb id 06b9:0120. You can check the id by running lsusb. This returns a list of all connected USB devices. 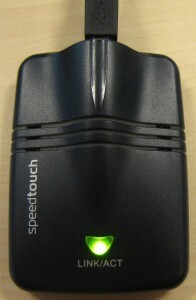 To limit the output to list only the SpeedTouch device, add the -d option along with the usb id. It shows that it is an Alcatel device, mind the Intersil at the end. I’ll come back to Intersil later. There are two ways to handle this card. The best solution is to use the native prism drivers. Although this driver is available by default, the driver won’t work out of the box. Alternatively you can try to use the Windows drivers and use the ndiswrapper to link these drivers to the Linux system. This might work but I will focus on using the built-in prism driver. This is not a very complicated solution. 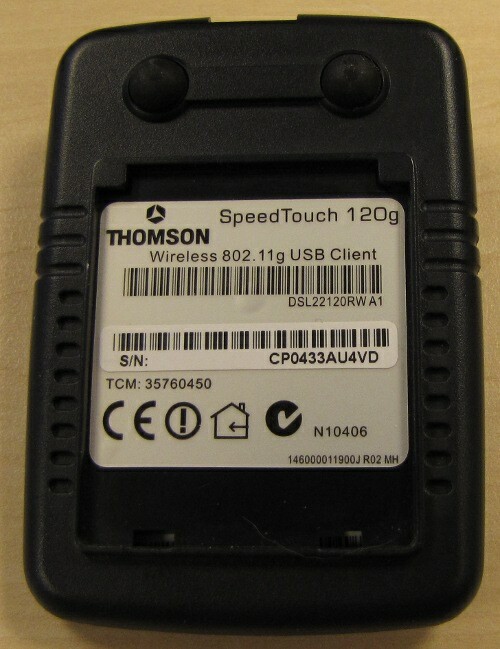 When you plug the SpeedTouch 120g into a Ubuntu 12.04 installation the system will try to load drivers to communicate with the card. If you want, you can debug this process and view the ‘/var/log/kern.log’. Below a snapshot of mine. usb 2-3: (p54usb) cannot load firmware isl3886usb (-2)! The kern.log shows that the driver p54usb is loaded which depends on the firmware file ‘isl3886usb’. isl stands for Intersil, which made the prism chipset for the adapter. The firmware file is required by the driver but cannot be loaded, that’s why the driver cannot communicate with the adapter. Talking about firmware, this is not firmware to flash your device like firmware for routers or accesspoints do, this firmware is loaded on your linux installation and does not affect the device itself. The required firmware must be installed by installing a package which contains the firmware. To make the card work you have to install the package ‘linux-firmware-nonfree’ which contains the required firmware. The package is available in the multiverse repository, which is enabled by default. Installation can be done by a shell command. Need to get 3,073 kB of archives. After this operation, 7,426 kB of additional disk space will be used. Selecting previously unselected package linux-firmware-nonfree. When the package is installed, the driver won’t load immediately. You can unplug and reconnect the device or restart the system. The first option works fine for me. You should find wireless networks (if available) in your network manager. Also, you can run ‘nm-tool’ to check some information about the network interface. The network interface is named wlan0 (or wlan1 if occupied). 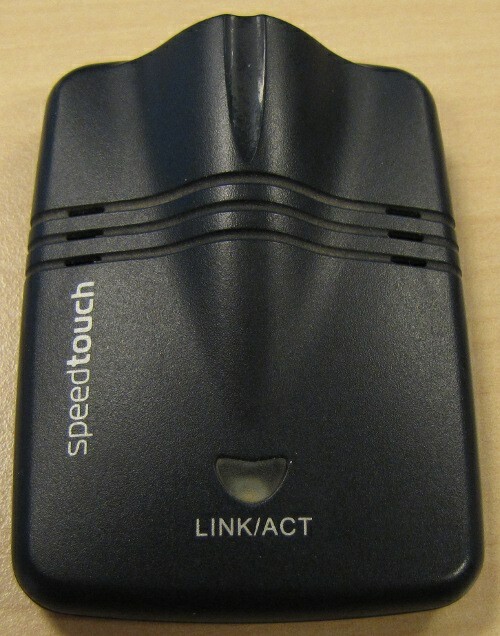 When connecting to a wireless network, the LINK/ACT led will indicate it’s all working. We’re finished now. Is that all? Yes, installing that package is all there is, have fun! When you started from a live cd you may experience some problems. The package is located in the multiverse repository which is not enabled when running the live cd. If you need the adapter to work in this situation you have to enable the multiverse repository. The easiest way to do this is by the graphical interface. Go to the power icon in the taskbar at the upper-right, option ‘Software Up to Date’, button ‘Settings…’, tab ‘Ubuntu Software’ and enable the multiverse repository. Update the repository information by running ‘sudo apt-get update’. Now you’re ready to install the firmware package as described before.